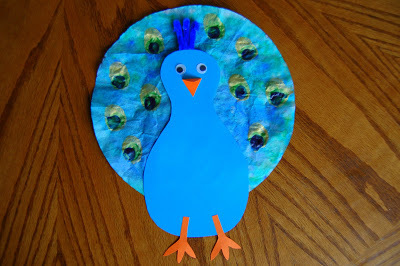 We finished up learning about birds by doing a cute Peacock Craft. 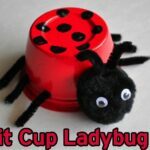 This is another Tippytoe Craft and you can read the full tutorial HERE. Luke wanted his to be red (his favorite color) so he used red markers on his coffee filter before I sprayed it. Tippytoe Crafts used cocktail toothpicks above the head but I could not find them anywhere! I seriously looked for 2 weeks at every store I went to, and I couldn’t find any. I was so disappointed. 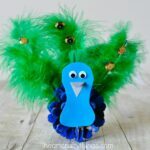 We almost didn’t do the craft because of it, but then I realized I could use blue pipe cleaners. 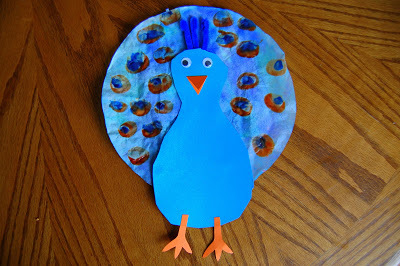 We folded down the ends to make it a little more full at the top and taped them to the back of the head before gluing the peacock body to the feathers (coffee filter). You can also see a close up of the eye spots on my feathers. I made mine to look like a real peacock by using the gold paint for my first print, then I used green and finally blue. The kids only used 2 colors though. 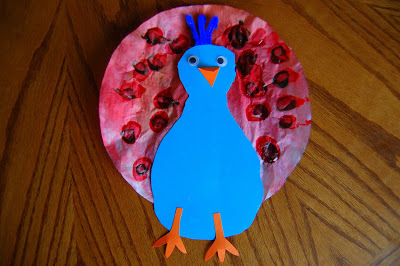 We decided to use our tempera paint which I received from CraftProjectIdeas.com. 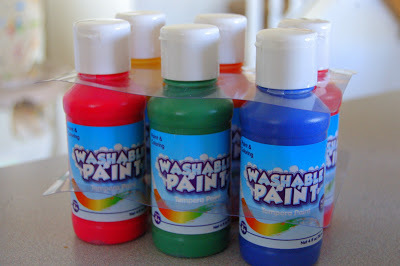 I’ve said it before, but these paints are pretty handy because they wash off of hands (and tables) so well. 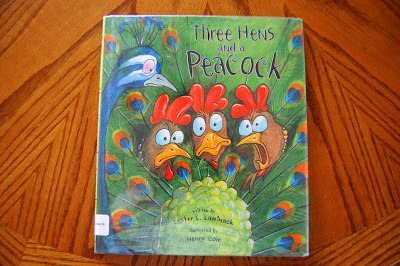 We also read this fun book to go along with our craft, Three Hens and a Peacock by Lester Laminack. It’s about a glamorous Peacock who comes to stay at the Tucker Farm and attracts all kind of attention from customers. The hens think it’s not fair, and the Peacock doesn’t feel like he’s as much use as the chickens, so the farm dog suggests they switch roles. You’ll have to read it to see how the chickens try to be glamorous and the Peacock tries to lay an egg. It’s a really cute story! Very nice. Thanks for sharing that link for the tutorial too. I just love the vibrant colors of your projects. 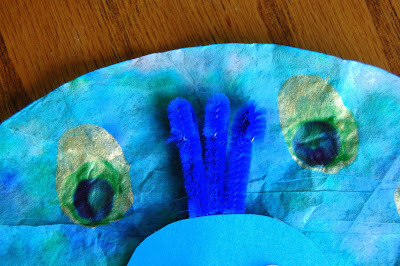 I have "pinned" this project and plan to use it for the week we do the letter P. Thanks also for the book suggestion. Sounds like the book is a scream. Your peacocks are beautiful! I find cocktail toothpicks at my grocery store, actually. But I think the pipe cleaners look great! And your eyespots are stunning. Thanks for sending more traffic my way! I love all the color in this project. The blue is so wonderfully bright. Those are very pretty peacocks, and the book looks like a lot of fun! love these peacocks! How cute and creative! 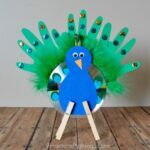 Very cute idea with the peacocks! I follow your blog, and I think all of your ideas are fantastic! This is such a pretty craft! The book looks interesting. I absolutely adore these!! I think we are definitely adding these to our craft list!! I would love if you would stop by and link up on my brand new kids activity linky party (Hey Mom, Look What I Did) at Adventures In Mommy Land!! Great idea for kids! i lile it, thanks for sharing. I'm such a huge fan of your blog here. 🙂 I would love it if you would link up some of your great ideas on my new Monstrously Creative link party! I'm featuring some great ideas this week, and yours could be next! Come join the party! I featured this post at the AfterSchool party this week. So cute! I used one of your pictures, I hope this is ok with you. Thanks again for sharing!